Forecast: Bad for the next 3-days. Looks like I’ll have to be careful! Notes: Crashed into a lamppost while I was trying to mount my bike. No damage. Phew! 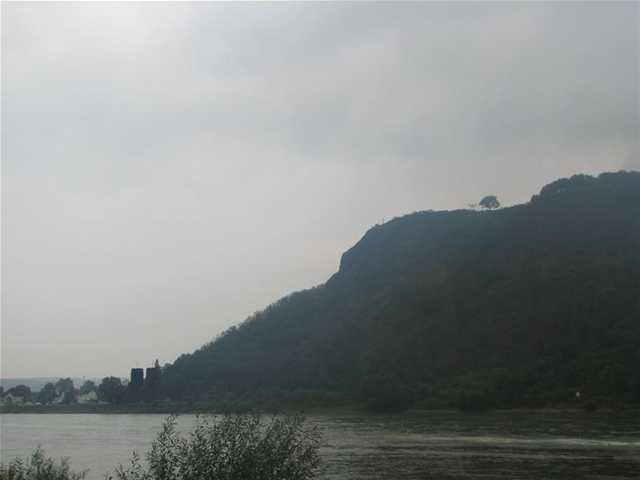 View towards Remagen (two bridge towsers can be seen at base of hill) in terrible weather. No sun, no energy although somehow I’m managing to squeeze enough out of the clouds to charge the phone which is pretty amazing. Luckily I have enough juice on the UMPC battery and the Li-Ion battery to give me about 4 hours of computing. If I spot any sun at all over the next 3 days I’ll have to stop and sap up as much as I can. Its going to be very tight. Will I have enough left for the final report in Duesseldorf? Right now I’m in Bonn and at home with my wife. I’m only using battery power and won’t be charging anything so there’s no change to the plan. Apart from a long bath and a good sleep tonight ready for the last two legs on Saturday and Sunday. Serves you right for trying to mount your poor bike. That’s what a week in the wilderness does to you eh. So me and Steve C will be joining you on Sunday, come rain or shine… Just let us know where we should meet you and more importantly, what time.